In this age of innovation, so often involving technology, it’s important to look back at what has already been established as a simple, good practice, and yet is too often forgotten. Since the early 1980s, numerous “design guides” in the form of books and articles have offered planning, architectural, and interior design recommendations to instruct architects and care providers on how to enhance safety, homeliness, and personalisation in dementia care facilities. Whilst the ideas in this report are simple and intuitive, they are not necessarily easy to do well. This report is useful for anyone interested in bringing to fruition ideas that help people with dementia. Everyone involved in long term care will benefit from reading this report, including policy makers and ombudspeople, management, medical, care, recreational and therapeutic staff. 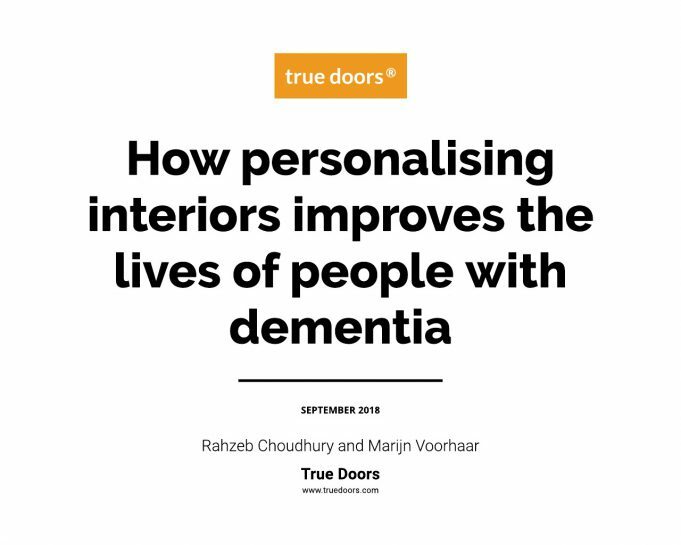 Complete the form below to get access to and download the report on "How personalising interiors improves the lives of people with dementia". I would like to receive news and offers from True Doors. Are you considering a True Doors pilot project with the goal of taking a person-centred approach? Get inspiration from our latest articles. True Doors are a simple idea with a big effect that improve the quality of life for people with dementia. © 2018 true doors ® All rights reserved.